Raspberry Shop - Buy Raspberry Plants Online and More! Welcome to the Online Raspberry Shop at Raspberry Depot, where can you buy raspberry plants, growing aids, trellis, protective netting, pruning shears, freeze dried raspberries, raspberry powder, raspberry skin cream, and everything raspberry related! Here at The Raspberry Shop, Raspberry-Depot is pleased to offer you products that will help and inspire you to grow your own raspberries, and for those of you who already grow raspberries, to continue growing this amazing delectable and healthy fruit. Whether you are looking for raspberry seeds, raspberry plants, freeze dried raspberries, powdered raspberries, raspberry pie fillings and jams, medicinal raspberry products such as skin creams, or even the best of raspberry candy ... you can find links for all this, and more (!) for sale at this Online Raspberry Shop. What are the Different Varieties of Raspberries? How do you Plant Raspberry Plants? Can you Buy Organic Raspberry Plants? Be sure to check the reviews and the details regarding the raspberry plants, including the growing zones where a particular variety of raspberries where growing them will be most successful. There is nothing more annoying than anticipating a wonderful raspberry harvest, only to see that the thieving birds, the deer and other pests are getting to the fruit before you do! You can purchase heavy duty bird netting (see below) to protect your raspberry patch. This extra strong garden net is easy to use, doesn't tangle and is reusable and provides lasting protection against birds, deer and other pests. It's no fun anticipating the day when you can finally pick those yummy, juicy raspberries, only to find the pests have helped themselves and made a mess of your raspberries before harvest time. It's important prune your raspberry canes to ensure quality growth and to improve the yield of your raspberry patch! A good pair of pruning shears is indispensable when growing raspberries! I love the pruning shear holder and the - so handy when you are needing both hands. For centuries, red raspberry leaf tea during pregnancy has been considered a natural tonic for expectant mothers. This tea has earned it's reputation for an over-all remedy for improving women's reproductive health, including increasing fertility, and benefits during pregnancy, childbirth, and breastfeeding. Interested in Making Your Own Raspberry Tea? Raspberry Ketone products have received much publicity, (and a positive endorsement by many), as a weight-loss supplement. Find Out More: What are Raspberry Ketones Anyway? Raspberries contain high amounts of ellagic acid and other compounds that have significant amounts of "cancer-fighting" properties. Ellagic acids, which may slow down the growth of some cancer cells, is found in raspberries (including the seeds! ), in fact raspberries are a leading source of the acid. There is something about raspberry and chocolate and how they pair together. One of my favourite coffee flavours is raspberry-chocolate -- I think it's because I can enjoy all the chocolate taste, knowing that the calories are not what they would be if I was really eating chocolate and raspberries! From flavoured lemonades, iced teas, and handcrafted sodas to lattes, mochas, flavored brewed coffee and more, raspberry syrup is a great staple for every kitchen! The benefits of dried raspberries and raspberry powder is that they offer the yummy taste and health benefits of this fruit, even when they are not available fresh in your area. These berries are also a great choice to have on hand in the case of emergency preparedness since unopened, they have a very long shelf life, they are light weight for hikers' backpacks and they can be substituted in many recipes that list raspberries as an ingredient! Although the seeds of raspberries are a nutritious part of this fruit, when it comes to making juices, sauces, jams and jellies, it may be desirable to remove some or all of the seeds. This can be done in various ways, depending largely on the volume of raspberries that you are processing for your recipe. Methods include using a metal strainer, a jelly bag or a Victorio Food Strainer with a berry strainer attachment. The Victorio Strainer is an amazing kitchen tool! I have one for applesauce making - and I LOVE it! With the Berry Screen attachment large amounts of berries can be processed to remove the seeds. (Be sure to check the specifications of this product and the customer reviews who have used it for berries). 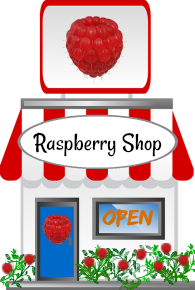 Thanks for Visiting the Online Raspberry Shop!